Showing results for tags 'liefeld'. I know this looks like a joke, but is anyone else following this series? It's actually pretty dang good, with great art and a surprisingly decent story. If I'm honest, it's actually the book on my pull list I most look forward to. Never would have thought I'd ever say that about bloody Youngblood of all things, but there you go. It's just a ton of fun. Anyone else reading this series? Enjoying it? 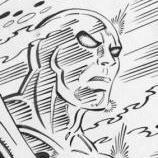 GEL2015 posted a topic in Comics Market - Want To Buy!